Another Wonderfest has come and gone. I mentioned to my friend Kirk Schermerhorn as we were driving up to the show that Wonderfest weekend is always a blur. We arrive on Thursday night and the next thing you know, it is Monday morning and we’re on the way home. This year was exactly like that. First let me begin by thanking Dave Hodge, Donnie Waddell, Dave Conover, John Davis and the entire crew at Wonderfest for putting together the best modeling event in the country. I’m sure I’m missing several people, but here are just a few of the many hard working members of the team: Lee Staten, Brian Ludden, Crazy Joe Nejberger, Melinda Angstrom, Drew Roberts and many others. Without the efforts of all these fine folks, there would be no Wonderfest. For those of you that may not know, Wonderfest is the single model event in the United States devoted to science fiction, monsters, fantasy, spaceships and all aspects of “fantastic modeling.” The show salutes the fantastic film genre, with guests from the SFX industry as well as a few classic film stars. 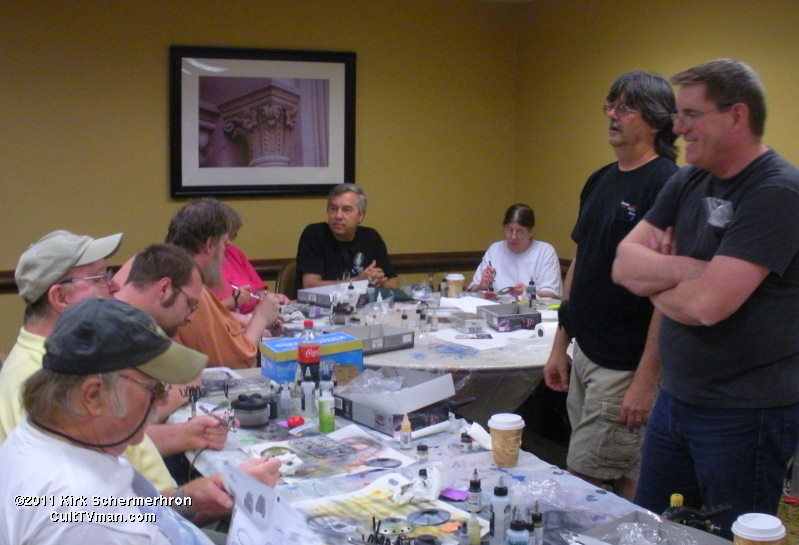 There are workshops, panels and demos about model building. There are presentations by the guests. 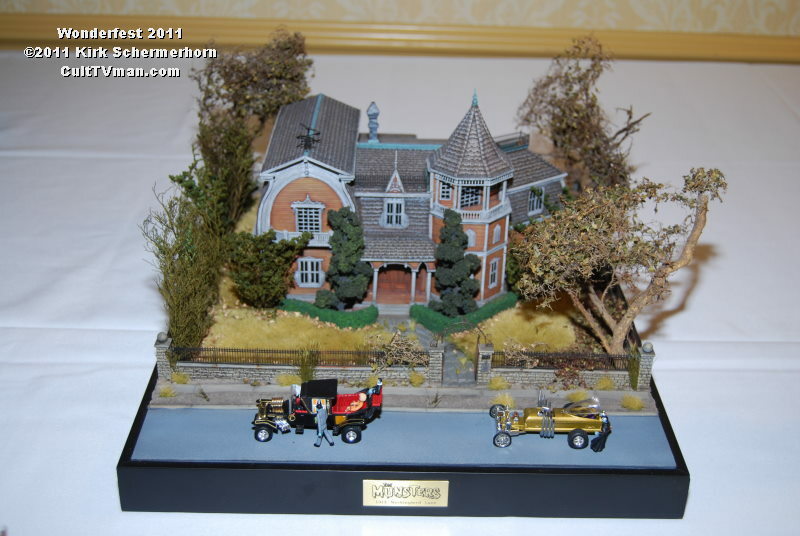 The heart of the show is the model contest with hundreds of great models on display. And the dealers room is the finest shopping mall for any hobbyist. There is so much to experience that you can’t fully take it all in. For me, the great thing about Wonderfest is getting together with friends and fellow modelers. It is the chance to meet new people and build lasting friendships. I’ve lost track of how many years I have been going to this show, but it is something like 12 or 13 years. 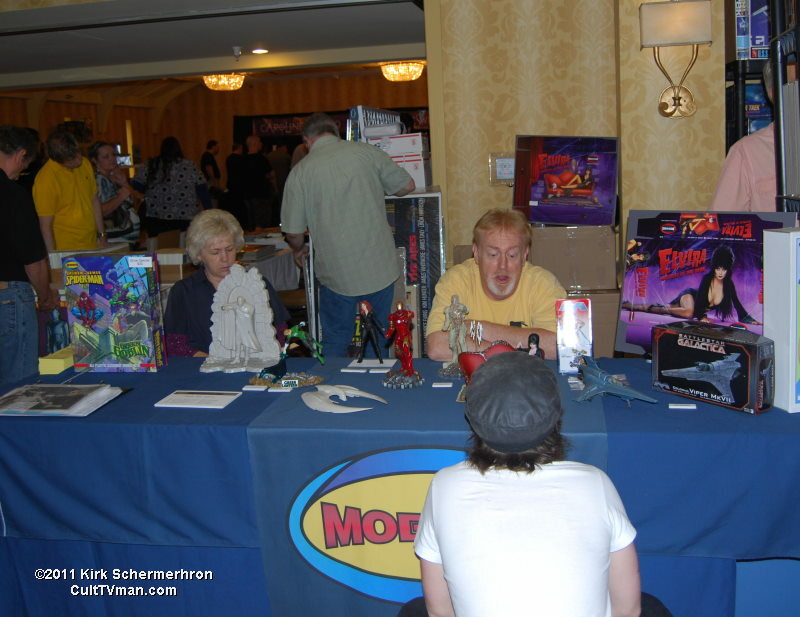 I met some great folks at this show and look forward to seeing them at Wonderfest every year. Thursday night is always the calm before the storm. People start to arrive at the hotel, and we soon see many familiar faces. This is a good time to say hello to folks, share dinner, and have a few drinks. After a couple weeks working long hours to get ready for the show, its pretty nice to relax a bit! We started Friday morning with Sci-Fi University, a workshop designed to help build the skills of science fiction modelers. The event is promoted by Federation Models along with CultTVman. Hummingline Hobbies helped run the workshop. This year, participants spent half the day with Tom Grossman and his team, working with airbrushing, using Iwata airbrushes. 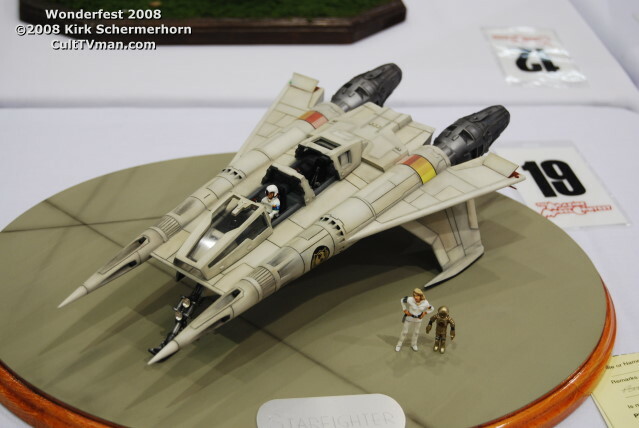 They worked on Alpha Centauri flying saucer kits provided by Pegasus Hobbies. The other half of the day was spent with other instructors, covering various aspects of modeling. Our friend Bob Hickl covered weathering and additional airbrushing techniques. Paul Bodensiek from Paragrafix was demonstrating how to use photoetch on your models. And Scott Spicer reviewed pattern making and scratch building techniques. We had approximately 30 participants in the day long session. My thanks to everyone that joined us and the people that shared their talents and skills. Following SFU, we migrated to the dealers room to set up our table. It really makes a difference to have a lot of help. My thanks to Kirk Schermerhorn, Dave Metzner, Scott Johnson, and Jim James for their help all weekend. These guys got us unpacked, organized, and ready for the masses on Saturday. 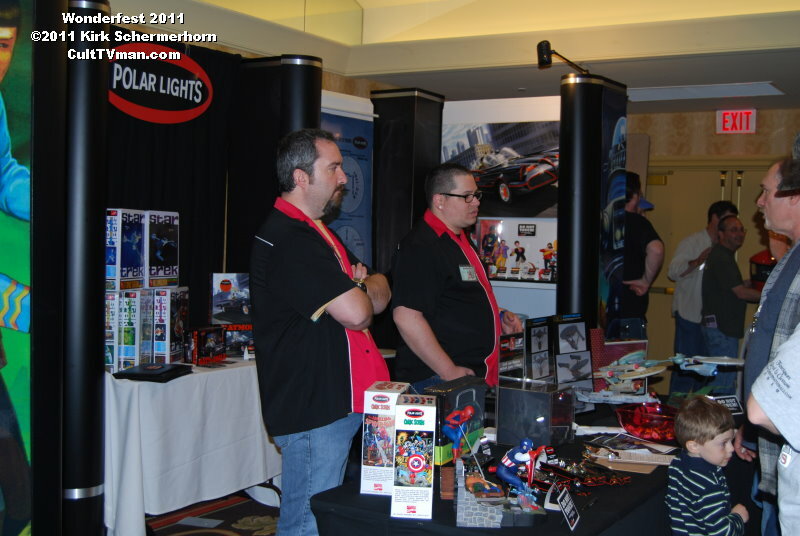 Not only are they great helpers, but they offer a lot of great customer service to the folks that come by the CultTVman table. Of course, we had a little time to eat and catch up with friends in the restaurant and bar. Already, the weekend is flying by. Saturday we were up early for breakfast and off to the dealers room. The “early birds” start showing up at 8am, cash in hand, ready to be the first to buy. They pay a bit extra for early admission, but for them it is worth it. For everyone else, the dealers room opens at 10, and they line up from the doors of the dealers room all the way to the hotel lobby. When the doors open, the masses descend and flood the room with buyers. People are shopping for those kits they just have to have, be it a monster or a spaceship. They may be looking for the latest issues of their favorite model magazine, or the light kit for their starship, or a replacement head for their Frankenstein kit. There is a little something for everyone at this show, and no two dealers have the same merchandise. This is where the garage kit industry shines, as the kit makers from all over the country present their products, a unique selection of merchandise that cannot be found anywhere else. Sales for me were down a bit from the last couple years. I think there were plenty of people at the show, but they may not have been spending as much. I talked to a lot of other dealers and many had lower sales this year, but several others I talked to have great years. I think the spike in gas prices hit a lot of people in the pocket book this year, leaving less to be spent in the dealers room. This year’s model contest was the largest in the history of Wonderfest. Well over 500 models were on display. Every type of monster or spaceship imaginable was here. I’ll be posting photos over the next few days and weeks showcasing all this fine work. Saturday night, the room was closed for judging. The great thing about Wonderfest is that each model is judged on their own merits. If a model deserves a gold, it gets a gold. Conversely, if a model is not well done, it will not get anything. Over the years, I have seen a great increase in the quality of model work and talent displayed. There were some amazing models at this show. Every year, I hear people say that they are afraid to enter the contest, or that their work is not good enough for the contest. I would encourage anyone, no matter what your skill level or ability, to enter the contest. There is no greater learning experience than to see your own kit sitting along side a much better model. It is very humbling, but it will encourage you to do better, learn new skills and grow your abilities. Both Moebius Models and Round 2 were at the show, presenting the newest kits in their line. Moebius announced an eight window movie Seaview, Iron Man mk III reposed, the Cylon Raider, the Bride of Frankenstein and a few others. Round 2 confirmed they were producing the 1:350 classic Enterprise and reissuing a number of vintage kits. I’ll post more details in another post. 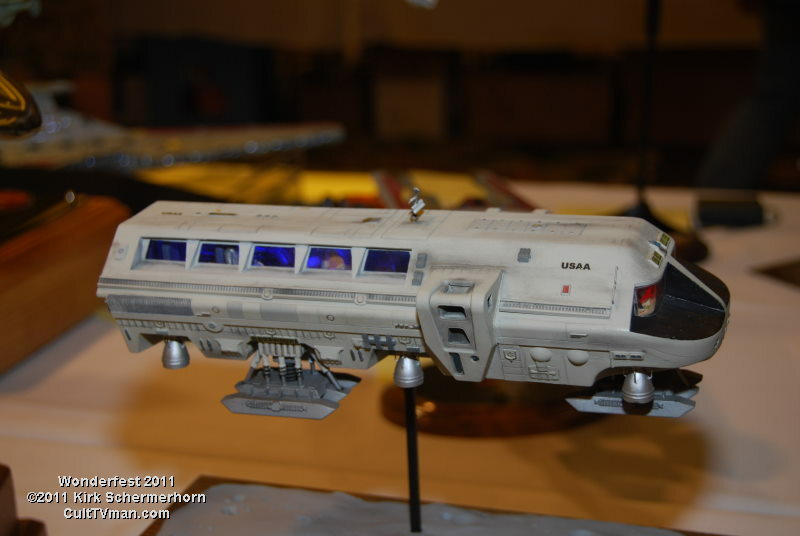 Atlantis/Megahobby and Monarch Models did not attend the show this year. Saturday night is always a big night at the show with lots of fun events. Caroline Munro introduced a screening of her cult favorite Starcrash. But over in the CultTVman Suite, we were having our own Caroline Munro film fest and we invited Caroline to join us. I was sponsoring her appearance and produced a kit of Caroline. Caroline and her daughter joined us for the end of Golden Voyage of Sinbad. The show wound down on Sunday. There were more demos and presentations. 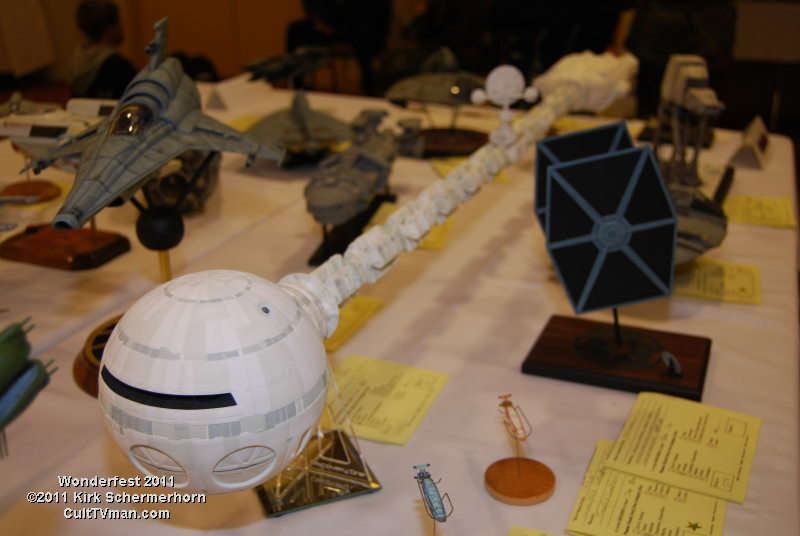 Other guests at the show were Hammer legend Martine Beswick, and Star Wars SFX artists Lorne Peterson and Pat McClung. 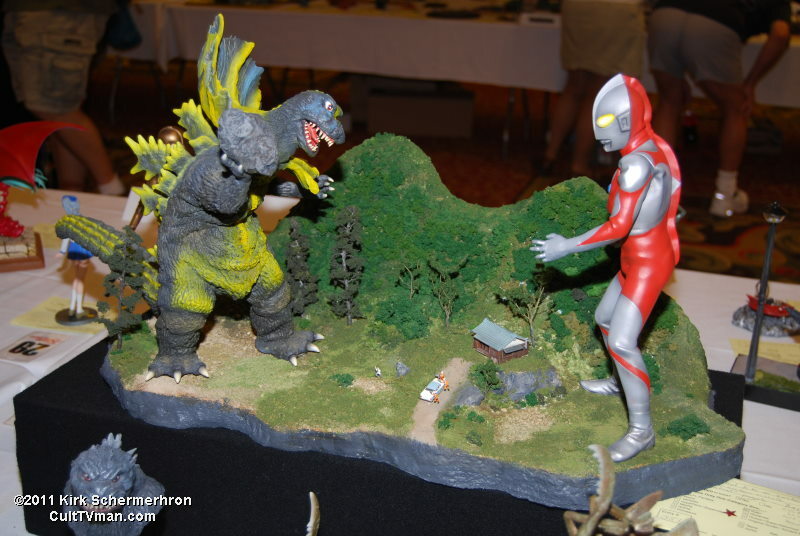 Cortland Hull brought a display of his life size monster figures. There was another display of Aurora Prehistoric Scenes kits. 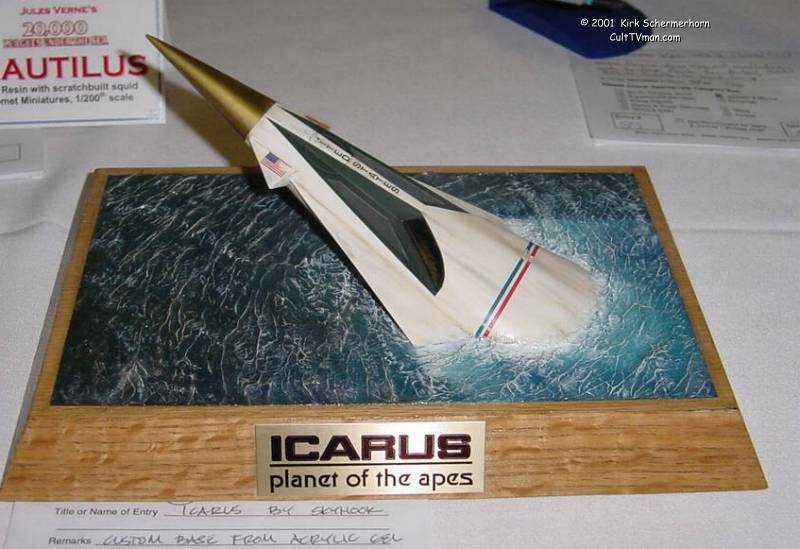 Moebius Models sponsored a Make and Take room where young modelers could build a kit. There is a raffle to raise money for WHAS Crusade for Children and a silent auction to help Guiding Eyes for the Blind. The Rondo Award ceremony is held at Wonderfest, honoring many different contributions to the Horror genre. The show ends with a small dinner on Sunday night, with some unique presentations and a chance to say thank you to all the guests and crew for the show. And suddenly it is Monday morning and time to go home. It all happens so quickly. Mark your calendar for next year. Wonderfest will be May 26-27, 2012, which is Memorial Day weekend. I hope to see you all there! It goes by so fast, but you feel like it lasted a week. Great synopsis on the Fest Steve but I am bumbed!!! How did I mange to miss that viewing of Sinbad with the lovely Caroline up in your room Saturday night. I was sitting down at the showing of Star Crash that was so bad it was too much to sit through the entire movie. So I went back to my room when I could have been at your room doing something fun! Hey, and I spent 75% of my money at your booth as well! But with the economy and gas prices I can understand how sales were down. Hopefully better times next year and thanks again for SciFi U.